The Oberoi Vanyavilas, Ranthambhore offers guests the opportunity to see Royal Bengal Tigers in the wild and enjoy the luxuries of an Oberoi experience. Designed to resemble a Rajasthani haveli (mansion), the centerpiece of the Oberoi Spa at Ranthambhore is a sunlit central courtyard. This luxury spa offers a wide range of Ayurveda-inspired and signature Oberoi treatments. We also offer private and small group yoga sessions within the grounds. Guests looking for a luxury dining restaurant in Ranthambhore will not be disappointed by our magnificent indoor and al fresco main restaurant, with its daily changing menu of authentic Rajasthani specialties, pan-Indian and continental dishes. Its unique ambiance is enhanced by traditional bonfires in the winter and live folk musicians, year round. Nahargarh, the most luxurious hotel lies nestled at the foothills of 'Aravali ranges' neighboring the Ranthambore National Park. Surrounded by a 16th-century style fortress, Nahargarh is built like a traditional Rajput hunting palace complete with a vast "Char Bagh" or formal Mughal garden. 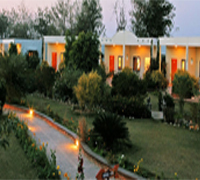 It sure is the perfect base to explore Ranthambore from the lap of luxury filled nature. With 68 ultra luxurious rooms, it offers the best-in-the-industry facilities for accommodation and dining. Nahargarh with its vast gardens well-appointed conference halls and luxurious accommodations is also an ideal location for hosting fairytale weddings and conferences. 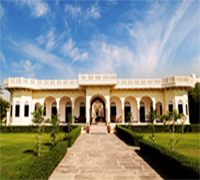 The Sher Garh is a royal heritage resort in a breathtaking four hectare's oasis of beautifully landscaped gardens. The Sher Garh enjoys an unrivaled position, just 1.5-kilo meters from the iconic RANTHAMBHORE NATIONAL PARK. Each of our room affords uninterrupted views of the JUNGLE. 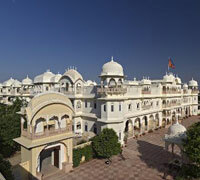 The Sher Garh epitomizes traditional Rajasthani charm & luxury. The dining experience at the fine-dining and multi-cuisine restaurant at the shergarh resort borrows the tradition of excellence and elaborate excess tempered by contemporary creativity. You can enjoy major kind of indoor games at The Shergarh Resort. Indoor games like Table tennis, carom, chess & all others. Nestled at the edge of Ranthambore National Park in Rajasthan and set over an area of 10 acres, The Pugmark is the true combination of sheer comfort ability and resplendent luxury. The judicious blend of modern architecture and inventive landscaping are the glittering gem of the resort. And as far as services and facilities are concerned, The Pugmark has left no stone unturned in catering modern conveniences in order to serve all guests flawlessly. Cave Palate is a multi-cuisine restaurant offers a sumptuous buffet for all meals, Adjacent to the main restaurant, at the garden of resort Guests are entertained with live Rajasthani, Indian cultural performances in the evenings. Ranthambhore Heritage Haveli located in the land of Tigers "Ranthambhore" Sawai Madhopur Rajasthan. The resort has been elegantly built in traditional architecture keeping in mind the natural surroundings and Rajasthani culture. At the Ranthambhore Heritage Haveli, we are there to ensure that you receive the best comforts and good hospitality in our Haveli. We have well-furnished 20 DELUXE ROOMS and 06 cottages in Ranthambhore Heritage Haveli.